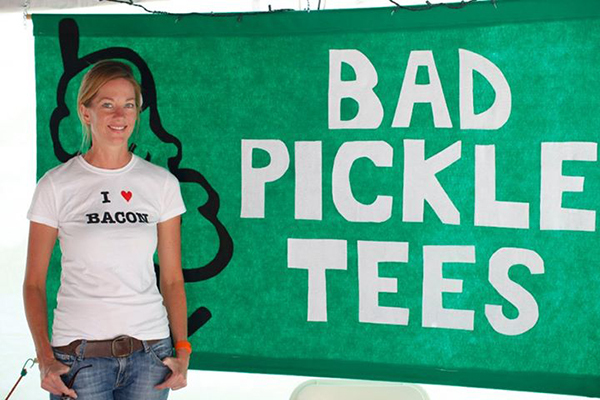 I first was exposed to Bad Pickle Tees when I spotted the lovely Mona of Moxxe PR wearing the "Duck, Duck, Confit" shirt at the SoCo Farmers' Market Farm to Food Truck Challenge III; yes, I still remember what she was wearing. The shirt design was so memorable, and I needed to get my hands on one but I didn't know where to find them. 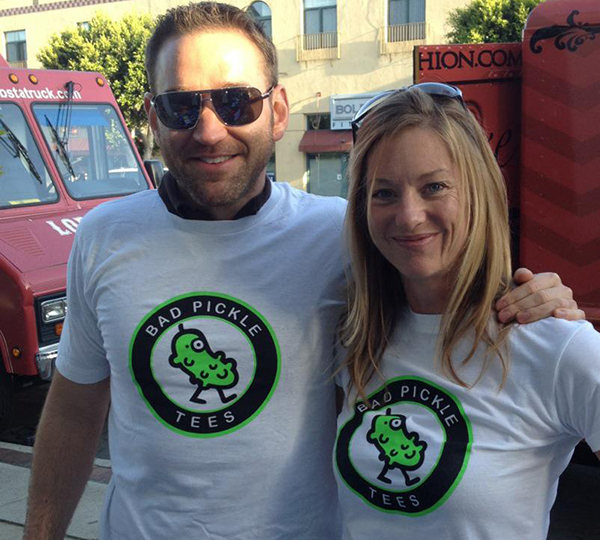 The next time I came upon Bad Pickle Tees was at The Great Park's 7th Anniversary Celebration where Owner Cyndi Grasman was selling her shirts next to the Baconmania food truck. How could I resist? Duc and I quickly bought the designs we wanted and have been wearing them since. It isn't too often that you run across a great find like Bad Pickle Tees (BPTee), especially seeing as it is mainly a one woman operation right now. I got the chance to touch base with Cyndi about her operation and talk about how it all got started. Every time I wear my "Tasty Pig Parts" shirt, I always have people asking me where I got it because it's so great for foodies. I'm sure they find it surprising when they visit the Etsy shop and realize that it's just one person running a business she started out of creative love for food. How did Bad Pickle Tees start? What were/are you doing aside from it? "I had the idea for Duck Duck Confit in my head for a long time. So for Xmas 2011 I asked for a DIY screenprinting kit from Michael's to make it (because I'm crafty like that). I made it and started to wear it around. People kept approaching me asking me where they could get one. I made a few and then realized I should try some other ideas I had, and voilà, within 4 months I had my own line of shirts. Before that I was (as you probably guessed) in the restaurant industry." Where does your inspiration come from? I love the puns! Do you take requests? "Hmmmm, inspiration - usually involves a few beers. I am CONSTANTLY having people come up to me saying, "You should have a shirt that says this!" [It happens] so much that I am thinking of having a contest where people can submit their ideas/artwork and I, along with my fans, will pick a winner. I will do a small limited edition run of it, sell it, and donate the profits to a charity of their choice. But honestly, I am so incredibly busy with BPTee that I don't have time to take requests." Darn, I have so many ideas to give too! Oh the puns, the puns! Sure, not every one of them has something punny but you have to admire what she prints out. I've seen them go from quite meat-centric to more of an overall food theme. Not only are they clever but the shirts themselves are soft and comfortable to wear. Perhaps you should pick up some for every type of cuisine you could eat. Display your love for food proudly across your chest in a variety of colors! 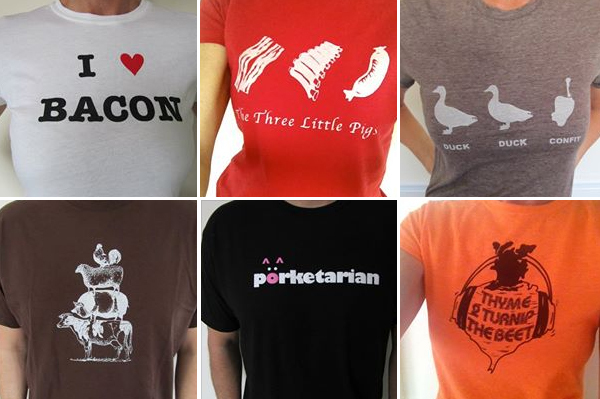 Your tees are what people might call the perfect tees for a foodie. Are you a "foodie"? How would you define one? "Am I a foodie? OF COURSE I"M A FOODIE! Hehe, what a silly question. A foodie is basically a junkie whose drug of choice is food. Their high is that first bite - the one that melts in your mouth and lights up all your taste buds." Do you draw all of your artwork? "The majority of my stuff is drawn. Some of it is prints. Ex: the Butcher Pig I use is a famous French print that is widely used by many cookbooks and such." How have people reacted to your tees? "People love food. They are really passionate about it. Not just 'foodies' but everyone. Everyone has a memory they connect to food or a recipe they pass down or a taste that brings back home. Because of this, most people love my shirts. I can't count the number of times people have come up and said, "This is the best shirt ever!" or "I have to have this shirt." And almost no one can resist laughing at the shirts. It is so awesome to stand in my booth and listen to people as they walk by, read the shirts, and giggle. It is even more awesome to talk to all the guests and hear their stories connected to food. I have met so many amazing people this way and heard so many great stories. It is not uncommon for a transaction to end in a big hug. I am so blessed." The most recent developments in the BPTee designs have also been collaboration with other organizations such as the 626 Night Market with their custom "Pho Shizzle" and "Bao Chicka Wow-Wow" shirts (pictured above). In addition to finding the shirts for purchase at Cyndi's Etsy shop, you will also spot her at major food-oriented events such as festivals, fairs, special events (more recently Nepenthia Beer Garden), and so forth. With nearly 600 sales online and a multitude more from in-person booths, BPTee will hopefully soon become a household name I say. Don't fret though if you're looking for more - I hear news that it won't end at t-shirts! Any future plans of merchandise aside from tees? For example, I think it would be fantastic to have buttons or aprons! "Other plans. Yes there are. Not sure when, but there are. You have to remember I went from one t-shirt to a full blown business in a matter of months (and BPTee has only been around just over a year). I was not looking to start my own business; it just happened! I was so stressed out trying to keep up with demand without any systems in place that the first 6 months I cried almost everyday! And every time I feel I catch up, I grow again! Most recently I started selling wholesale around the country. Then of course, I have quite literally about another 60 shirt ideas rolling around my head that I want to do. But yes, there are plans for aprons, posters, hats, socks, and all that good stuff." A lot of your shirts seem to be sold through your Etsy shop and at events you attend. Where's the craziest place you've had to send a shirt? "Hmmmm craziest place I had to send a shirt? Probably Finland. I had a very random run of the 'My Favorite Animal is Steak' tee. I had about a dozen individual orders for that shirt from people in Finland the first month I was in business. Also, I had a butcher in Czech Republic order a slew of shirts from me to sell in their shop. That was kind of cool, and now I have a place in Czech Republic to eat all the free meat I can possibly shove in my mouth. But the funniest shirt I ever sold was to a lady and her daughter who came up and demanded "Praise the Lard" shirts. I sold it to them and they told me their daughter's boyfriend's last name was Lard, and they were going to wear it to his graduation. They laughed themselves silly." With so many experiences captured through our memory of food, it's hard to imagine someone not relating to at least one of her shirt designs. Every time I scroll through the shop listings, I chuckle to myself as well and have distinct memories that are brought up with each read. I absolutely also enjoyed the way that Cyndi described a foodie because isn't that what our drugs are? The food? Do fans send in a lot of pictures of them wearing your shirts? What were some of the more creative ones? "Oh my, I get a lot of pictures! 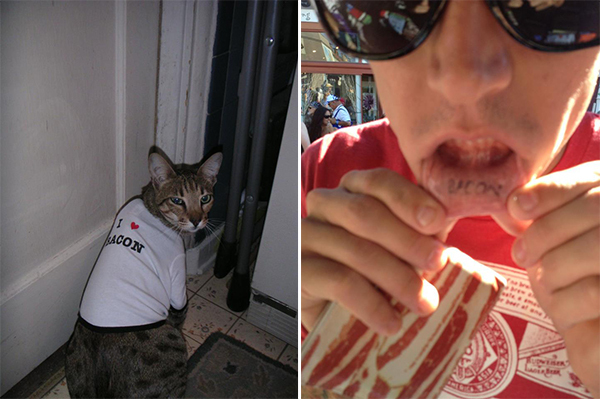 The most creative was a guy who put one of the dog tees on his cat. The look on that cat's face gets me every time! Oh and some random guy who was not wearing my shirt sent me a pic of the inside of his lip (and his gingivitis) where he had the word 'bacon' tattooed. I will never unsee that." Aside from running BPTee, Cyndi also enjoys crafts (a little obvious now right?) and triathlons, though as she says, "I really do it just so I can eat more." Maybe I ought to get on a triathlon kick too then huh? If you're looking for a way to win her over with food, she'll never deny duck confit, roasted brussel sprouts, or pineapple upside down cake. Just don't cook her salmon - "It tastes like dirty feet to me." Additionally, you can also toss your lot into the randomness of the online giveaway world and try to win yourself a Bad Pickle Tee in MEN'S and/or WOMEN'S sizes. Check out the Rafflecopter widgets below on how to enter. ALSO, remember to show your love to Cyndi and Bad Pickle Tees by dropping by the Facebook page and saying hi. Thank you so much for your time and donating shirts for the giveaways, Cyndi! The giveaway will run until 7/14/13 at 11:59pm PST. Winners will be contacted upon winning and have 48 hours to respond before another winner is drawn. You may enter both giveaways and if chance allows, win both prizes. I have the "Oh Kale Yeah" t-shirt that I got at Patchwork last month. I really want the stacked animals one. Love Bad Pickle Tees! I love the Thyme to Turnip the Beet shirt! And Duck Duck Confit. The latter would look wonderful in my closet next to my Touche Pas a Mon Foie Gras shirt. Nice! Cool shirt that you already have! Well if you don't win, you could just use the 25% off coupon code! 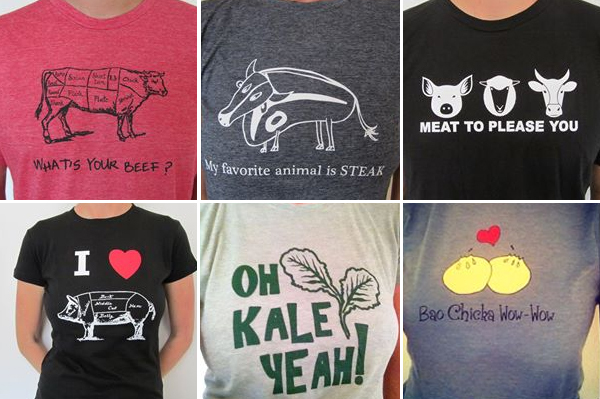 I love the butcher cow or pig one! Oh Kale Yeah is pretty sweet too!! Ohhhh the Kale shirt is the coolest! Color? I like the dark heather grey tees. But the "Oh Kale Yeah" pale green is too awesome to pass up! Why not both?! The heather gray look pretty sweet. I like the Oh Kale Yeah Tee!